My dear friend and mentor Henry Wills was one of the finest gentlemen I’ve ever met. In his chosen profession as a Hollywood stuntman, he was one of the greatest and most respected. Henry Wills was born in Florence, AZ, in 1921. After a summer visit to California, where he picked up some work as an extra in films, he decided to enter the uncertain field of movie making. Hank’s 50 year career started in 1937 when this expert horseman worked his way up from the ranks of extra, rider, posseman and all around cowboy to stuntman and stunt co-ordinator. There were so many westerns and action oriented films being produced during Hank’s time in Hollywood that he never held another job once he entered the business. Hank’s knowledge of livestock and wagons stood him in good stead once he started to co-ordinate and direct second unit action scenes. He was most in demand on westerns. Of the hundreds of pictures Hank has run the action on, some are certified classics. “Shane” with Alan Ladd, “The Magnificent Seven” with Yul Brynner, “Shootout” with Gregory Peck, “The Law and Jake Wade” and “Westward The Women” with Robert Taylor among many familiar titles. A lot of Hollywood’s top stars including Audie Murphy, Alan Ladd, Dean Martin, Robert Taylor, Richard Widmark, Roy Rogers and Jerry Lewis all insisted Henry Wills double for them in their films. Some actors were so fond of Hank and so impressed with his ability that he was written into their contracts. When I was first starting out I met Hank on location in Kanab, UT, where he was doubling for Dean Martin on “Rough Night in Jericho”. He took a liking to me and told me to stay in touch with him as he was signed to do a pilot for a new series, “The High Chaparral”. True to his word, I worked on the pilot and when the series sold Henry made sure I found work on it for the next four years. When I was invited to join the Stuntmen’s Association Henry Wills was my main sponsor, thus ensuring my acceptance into this elite group. In Henry’s long career as a stuntman there were some major injuries. When he was doubling for Marlon Brando on “One Eyed Jacks” he broke his pelvis in a horse fall. Setbacks did not deter Henry. 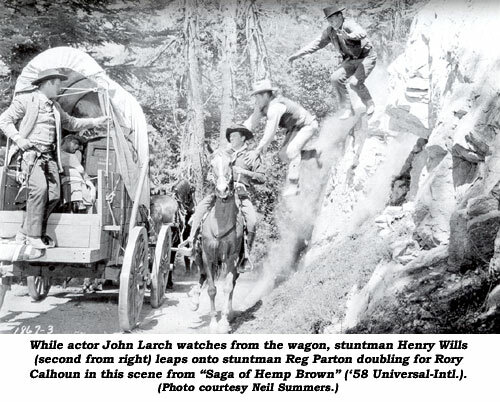 He loved making motion pictures and loved doing stunts, eventually setting the record for horse falls with over 1,500. Henry was a man of many talents including script writing, some of which were used on “The High Chaparral”. He was honored by the National Film Society and The Golden Boot Committee. The Stuntmen’s Association granted Hank a lifetime membership, an honor only bestowed upon a few exceptional individuals. In Hank’s later years film festivals around the country discovered him and he was a very popular guest with fascinating stories to relate during his panel appearances. 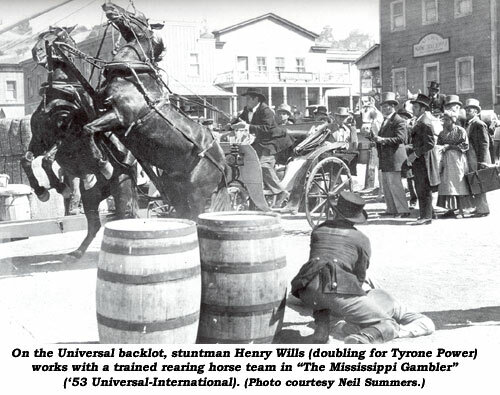 After a lifetime of giving his talent and body to the stunt profession, Henry Wills passed away of heart failure September 15, 1994. There are only a few people crossing our trail in life that are as special as Henry Wills was to me. He was a devoutly religious man and a soft spoken individual who did not toot his own horn. I can tell you there are very few men who ever come into our stunt profession that can even carry Henry Wills’ stuntbag. He was a master at his craft and the film industry is the loser because of his passing.